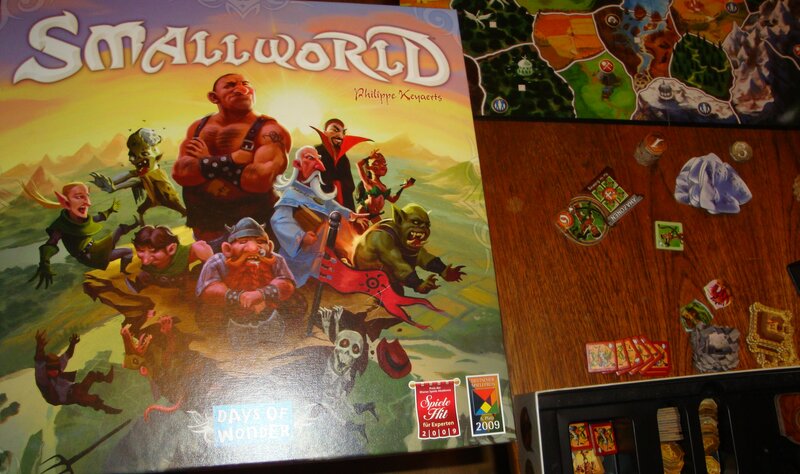 Summary: Small world is a game of conquering empires, but with a twist; every empire must eventually fall and be replaced. Players choose from a set of races and a separate set of special powers to create a unique army with which to conquer the game map. Players score victory points by capturing and holding areas of the map. It’s a nice little wargame with a good mix of special abilities so no two games are quite the same. Plus, berserker skeletons… what’s not to love? Gameplay: At the start of the game, the players are presented with an unoccupied map divided into territories, and a stack of potential armies* to choose from. The armies are made by combining a race card (randomly selected from the deck) and a special power card (ditto). Players choose from a stack of five available armies, adding new ones to the stack to replace the ones they pick. Each race and power has a number on it – add them together and you get the number of tokens that make up the resulting army. Once the armies have been picked, players take turns to use their armies to conquer territories on the board. At the end of each player’s turn they are awarded victory points according to how many territories they hold. There is no element of chance to conquest, for the most part – a fixed number of tokens can be used to capture a given territory – but if you have an odd number of unused tokens at the end of a turn you can attempt one final conquest with the roll of a special die. It takes more tokens to conquer a territory than it does to hold them, so there is a tendency for each army to get progressively more thinly stretched. Further, there is only so much territory to go around, so eventually players end up attacking each other, destroying each others tokens in the process. The killer mechanic in the game is the ability to send your army into decline. When this happens you miss a turn (bad) but you get to pick an entirely new race and special power, with a full set of tokens as if you had started the game afresh (good). Further, all the territories you captured with your last army stay captured, and you continue to score points for them (amazing). So it isn’t too many turns before you start wondering whether you would gain more points by retiring your current army, and indeed it is possible to keep starting new armies over and over if you wish. The management of when to go into decline is a key part of the game, and introduces a resource-management feel to what is otherwise a sort of light wargame. The strategy and tactics of the game comes from the mix of special powers and races available. Each army gets two special abilities, one of which comes from its race card and one from its special power card. There are 14 races and 20 special powers meaning there are 280 possible combinations of abilities that can come up. Abilities vary from relatively pedestrian, e.g. bonuses to attack particular types of terrain, to wildly game-changing ones such as the dragonmaster power which allows a single territory per turn to be conquered with a single token irrespective of how well defended it is. To the untrained eye, many of the powers appear absurdly overpowered (though in play they are reasonably balanced, and various mechanisms are present to avoid a runaway victor). The chaos which can result from the shrewd application of these abilities make the game fairly unpredictable, and adds a lot of enjoyment to picking your army. There is the usual effect associated with such games that if one player appears to be doing very well, s/he will often get dogpiled. The game tries to compensate for this by keeping everyone’s current victory point total a secret, but you can’t quite get away from the fact that runner-up players can be kingmakers. This is about the only gripe though and overall the game is a lot of fun and quick to play to boot. *Note, the game rules don’t include the term “army”. Races are used to refer to both the types of creature you can choose from and also the collections of tokens which are used to conquer the map. I have used the term “army” to refer to the latter to avoid confusion. Components: Small World comes with two game boards (for different numbers of players), a special die, 14 race cards and 20 special power cards, and over 300 tokens. The box is almost ridiculously well designed, so that the tokens for each race can be placed in separate compartments that are exactly the right size for them, for example. It’s a very nice-looking game, with cute illustrations, and the components are pretty sturdy too. The rules book is well-designed, and each card comes with a symbolic summary of its abilities on it which, once you’ve learned what the symbols means, reduces rules look-up a fair bit. Summary: Blokus is a simple strategy game that resembles a sort of competitive jigsaw puzzle. Players take turn to place pieces on a grid according to simple rules, with the key mechanic being that the pieces can block each other (hence the name). The object of the game is to be left with as few pieces as possible unplayed at the end of the game. The game is incredibly simple to learn and play, fast, and yet the tactics are complex enough to retain interest over many games. The game comes in 2 player and 2-4 player versions. 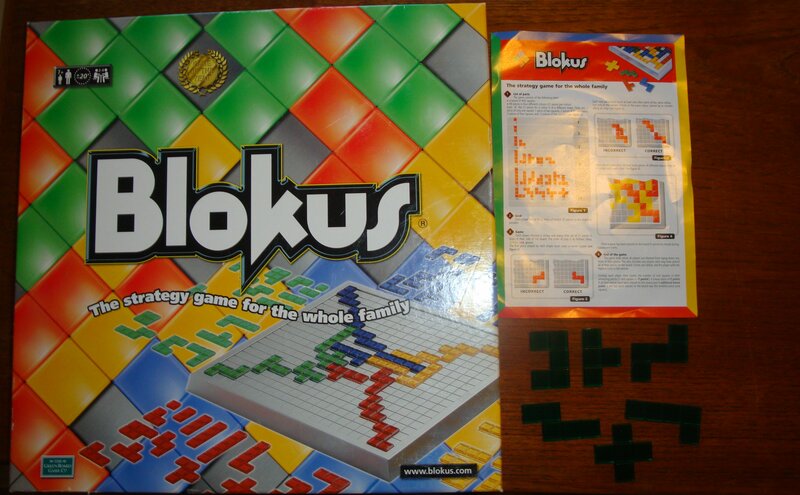 Gameplay: Each player in Blokus starts with an identical set of 21 plastic pieces in four colours. The pieces are made up of a varying number of squares arranged in a shape (see illustration). Each piece within a set is unique. Players take turns to place these pieces on a grid, starting in the corners (in the 2-4 player variant), and the continues to place each turn according to a simple set of rules: you must play each piece touching corners with another one of your pieces, and you may not play a piece touching edges with another one of your pieces. Gameplay revolves around trying to exploit the gaps left in the board by other people’s plays, while blocking other players from doing the same. Each player ends the game when they are unable to put any more pieces down; the game ends when all players have reached that point or run out of pieces. The winner is the player who has the smallest number of squares worth of pieces left over (there is a bonus for putting all your pieces down, and a further bonus if your last piece played is the one-square piece – harder than it sounds, since this piece is extremely useful for getting out of a tight spot). The above isn’t so much a review as a complete description of the rules. 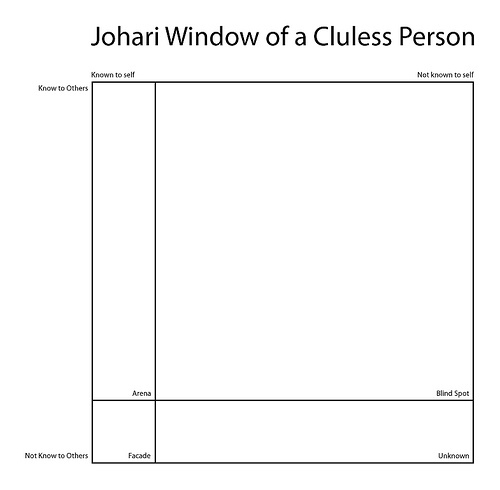 It really is that simple, which means you can pick up Blokus and start playing it inside of 5 minutes if you read fast. Play is fast, but despite the game’s simplicity the tactics have an enjoyable complexity. There is something rather devilish about (effectively) trying to complete a complex jigsaw puzzle while other people build their own jigsaw puzzles around you. Components: Four sets of 21 plastic pieces and a plastic game board. Simple and sturdy. The game rules are simple and easy to learn. There is also a smaller 2-player version which is portable enough to be used as a travel game to rival travel Scrabble, travel chess and so on.